Starting in February 2019, the Carisbrooke Dental Practice has begun to train the next generation of Dental Implant Specialists. Working in partnership with the University of Central Lancashire, Carisbrooke Dental Practice will be instructing dentists who are studying for their Masters in Implant Surgery. Our first 3 student spent the day with us learning how we help patients achieve a smile to be proud of through the use of dental implants. Our Specialist Dental Implant Team (Dr Neil Millington, Dr Jose Zurdo, and Dr Jeremy McCahill) spent the day with the Masters Students teaching them how to create 3D X-rays that can be used to plan the perfect position for dental implants. The Masters Students, under the close supervision of our Specialist Implant Team, will place dental implants in carefully selected patients who have all elected to take part in the course. 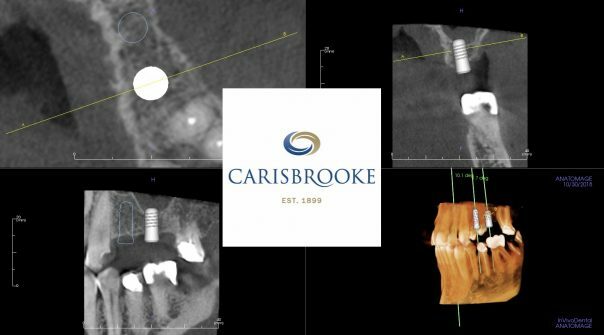 The benefit to the patients is Carisbrooke quality dental implants at a substantially reduced rate. We can’t wait to share the end results with you, so keep an eye out on our social media channels for more updates. If you are a referring dentist who has a patient that would benefit from dental implants and they have a BPE of 2 or lower, and no occlusial or periondontal issues, then get in touch!